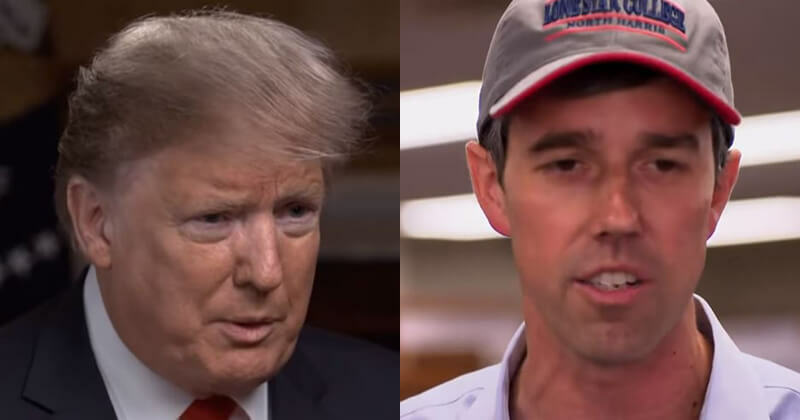 Texas Senate also ran Beto O’Rourke has not announced if he will face off against President Donald Trump in the 2020 election. But he is prepared to face off with him on Monday at the border in El Paso, Texas. The man who was defeated by Sen. Ted Cruz said he will be in a protest opposing the president when he visits the border, ABC News reported. The former congressman said Friday he will attend a rally in his hometown of El Paso meant to counter Trump’s appearance in the city on the same night. O’Rourke will speak at the event at 7 p.m., the same time the president takes the stage. “While some try to stoke fear and paranoia, to spread lies and a false narrative about the U.S.-Mexico border and to demand a 2,000 mile wall along it at a time of record safety and security, El Paso will come together for a march and celebration that highlights the truth,” the release from O’Rourke adds, in a paper-thin veiled reference to Trump. Trump’s rally, his first of 2019, will take place at the larger El Paso County Coliseum, while O’Rourke will speak at the Chalio Acosta Sports Center. The two spots are just a literal stone’s throw from each other. Both, maybe fittingly, are also right next to the El Paso Zoo. O’Rourke attempted to knock Ted Cruz out of the Senate in last year’s midterm elections, but came up short despite a wave of national support. Feb. 11 is four days before the deadline for Congress and the president to come to an agreement over spending, including Trump’s desired border wall, to avoid another government shutdown. The interview is set to air Feb. 16 on OWN. Facebook has greatly reduced the distribution of our stories in our readers’ newsfeeds and is instead promoting mainstream media sources. When you share to your friends, however, you greatly help distribute our content. Please take a moment and consider sharing this article with your friends and family. Thank you.